Maybe you live in Toronto. Maybe you’ll be at the Toronto Comics Arts Festival this weekend. But if you won’t be in the upper part of the North American continent over the next few days, you won’t be able to see some incredible video game art. But we can show some of it right here. 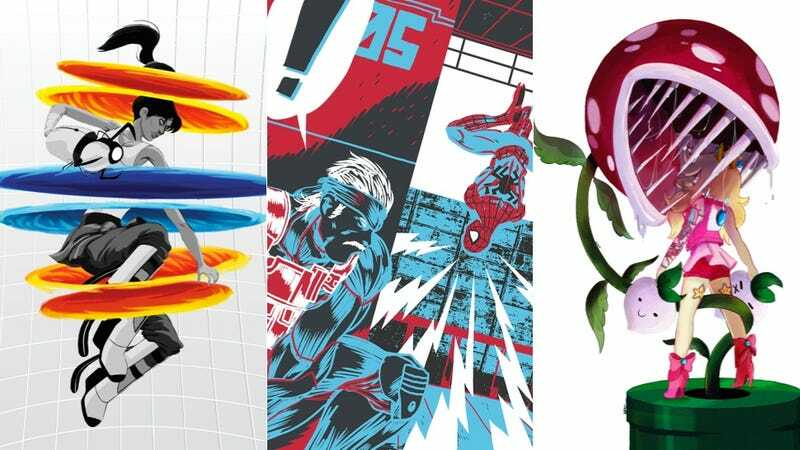 Running this weekend, the Comics vs. Games 2 showcase will feature awesome new work from creators from both mediums. Part of the associated events will be an art show with eye-popping work from Zac Gorman, Corey Lewis, Chris Furniss, Asid Siddiky, Jacob Frerguson and more incredible illustrators. Toronto is a hotbed of indie game creativity that companies like Capybara Games, Drinkbox Studios and many other developers call home. That means that if you’re at TCAF and go to the Bit Bazaar zine/arcade event, Comics vs. Games 2 gallery show or panel talk with Scott Pilgrim creator Bryan Lee O’Malley, you will probably meet someone who’s made something you like a whole lot. The rest of us will have to pine away from afar. Tell us how it all goes down, won’t you?